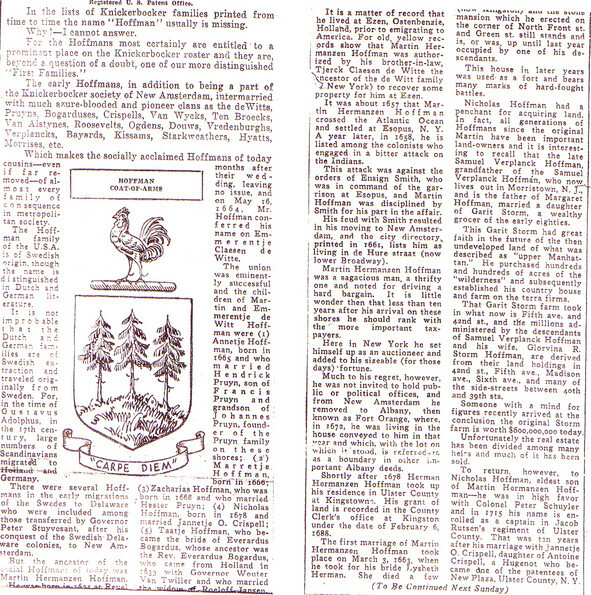 Garrit's Narrative is continued below the copy of the Knickerbocker news article on the Hoffman family. John B. Miller died in the month of December, 1845, leaving to his two sons, William and Christopher, and his daughter Mary, each the sum of $100,000. Christopher married Sally Verplanck, daughter of Phillip Verplanck of Verplanck's point, who added to his property sixti to eighty thousand dollars. They reside at New Windsor and have no children. William and his sister Mary are unmarried. What is to become of their property is, of course, unknown: Its destiney may prove singular, and those who come after me, may with these facts before them mark the result. The well known stanza of Dr. Watts often occurs to me, " We toil for heirs we know not whom." This blog is devoted to comments and questions regarding " Garrit Storm's Narrative" on the previous page. While the narrative was meant for the two daughters of Garrit, I feel that it will be of interest to historians and geneology buffs alike. Garrit Storm was of Dutch descent, his family settling in New York in the 18th century. Garrit managed to acquire a fortune in his business ventures, mainly in prime New York City real estate. You will read of his early years, his start in business and his acquisitions of property on 5th Ave, 42nd Street and other areas in early New York City. It is a long narrative, but very intersting in giving a glimpse into the early days of New York City, New York State and the young country in general. Mr. Charles Gouverneur Hoffman, a direct descendant of Garrit Storm. " Govey " was a truly fascinating man, in his own right. I hope to add more of his story to continue the geneology! This oil portrait was done by Linzee Prescott. Mr. H. was also a 32 degree Mason of the Scottish Rite. The above photo is of Irene Hoffman, Govey's mother and wife of W.M.V.Hoffman. The above photos depict: The Hoffman House, one of their major real estate holdings, 1870s and a $5000 endowment to St. Luke's Hospital by Rev. Charles F. Hoffman. The endowment granted Hoffman and his successors the right to a bed at the hospital " in perpetuity". This document is also 19th century.